The best known tourist attraction in all of Malaysia is without question the Petronas Twin Towers, the corporate headquarters of the national petroleum corporation. Unlike most other skyscrapers this facility does not charge an admission fee, perhaps because visitors are only allowed up to the sky bridge, a walkway between the towers located less than half way up the building. Even still demand is far beyond the 1300 daily tickets; we were in the queue before opening, but still ended up with a timed admission ticket for the middle of the afternoon. More to the point, the tour proved utterly anticlimactic; we were shown a seven minute video about how wonderful Petronas is, led through metal detectors, and brought up to the bridge with rain droplets obscuring the limited view through the windows. We were able to see far more from the nearby Menara KL tower, plus we didn't have to queue there. We went to visit the Mines Wonderland Theme Park later in the day, only to discover that its roller coaster had been removed at some point in the last year. The park as a whole was in a sorry state, looking very shabby in places; without considerable investment its future appears very uncertain. Cosmo's World is the newest amusement park in Malaysia, having opened as part of the Berjaya Times Square shopping mall just five years ago. Its star attraction is the Supersonic Odyssey (#1319), a three inversion coaster with a custom layout that intertwines its way around almost the entire park. The ride opens with a gentle drop out of the station leading to a slow heartline roll. Regular readers of this diary will be aware that slow rolls are not my favourite element. Be that as it may, the version here is taken gently enough to be enjoyable even for this jaded enthusiast. 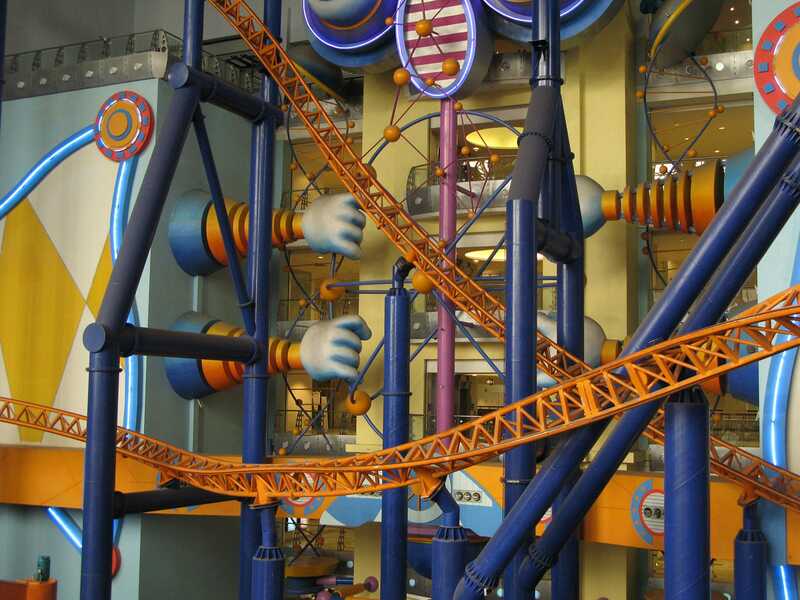 From there the train moves to a large tyre drive lift hill reaching all the way to the roof of the building. At this stage the ride shifts up a gear, with a substantial drop leading to a loop and a corkscrew element that feels incredibly forceful yet manages to remain reasonably smooth. In an open space this coaster would be worth a high grade, but in a tightly enclosed indoor arena with other rides nearby it it would be utterly wrong not to give it a ten out of ten. I've never seen a enclosed coaster which interacts quite so much with the other rides in its environment. I'd go so far as to describe it as the best shopping mall coaster in the world; it really is that good. Serious enthusiasts need to get to Malaysia to ride this. The rest of the park is divided into two main sections. A beautifully themed children's area features a carousel, a flying bus, a playground, and a few gentle spin attractions. The adult area contains some not-so-gentle spin rides, most of which were not a good idea so close to breakfast. In the end the only ride we made the effort for was the Spinning Orbit, an Intamin-built copy of the Huss Condor ride. This version was a definite improvement on the original thanks to outward facing seats and a much faster speed. One ride was enough to have me feeling decidedly queasy!